It wasn’t that long ago when a competent doctor might have told us that “there is no pain associated with MS.” It’s funny how much they’ve learned in the past few years. We’ve talked about some of the pains associated with multiple sclerosis here before. There have been discussions of the MS Hug, stabbing leg & foot pain, Lhermitte’s sign, etc. One MS Pain we haven’t much talked about is trigeminal neuralgia (TN) also known as tic douloureux. When people have this, they feel a hot, stabbing facial pain. We haven’t spoken about it in these pages because, quite frankly, I didn’t think that many of us experienced it. After one of the guys in my “MS Poker Night” guy’s group missed a meeting and returned the next month to tell us about it, I started looking around. 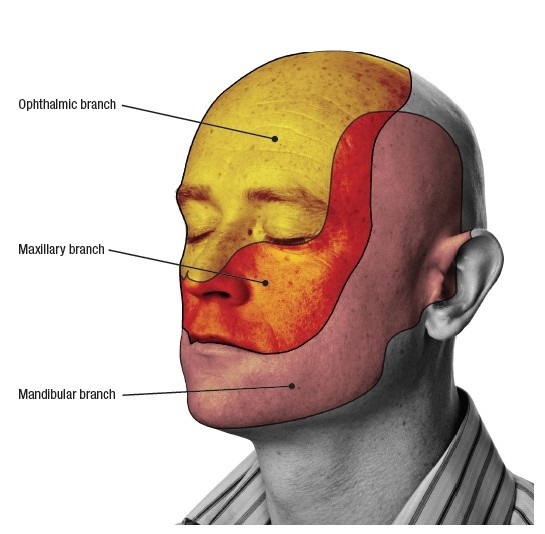 Just like any other nerve in the central nervous system (CNS), the Trigeminal nerve (which runs along the head, face and jaw line) can be de-myelinated. This stripping of insulation caused issues different than many others. The good news is that most people don’t lose function in the muscles controlled by said nerve (though I’ve read a few accounts). The bad news is that the pain can border on the unbearable. When it was described to the group, we all shrunk at the thought. This man was walking along on his daily exercise route when he was struck to the ground with pain radiating from the side of his head along his jaw. It isn’t a lasting pain for this man (about 5-7 seconds at a time) but it comes and goes to the point that he will no longer drive. Just like when I first heard of pain associated with Ocular Neuritis, I was shocked and horrified! Reading the bits and bobs I’ve found on the Web (even from pretty reliable sources) seems to be a bit more vague than I’m comfortable sharing. So, I thought, let’s go to my favorite source…YOU! I’d like to open the weekend’s conversation about trigeminal neuralgia and see what any of you know about the topic. Have you endured such symptoms? Have you even heard of it? Do you know someone with MS (or another disorder) who lives with these symptoms? I always, ALWAYS, learn so much from this community…and I’m not alone. Let’s share what you may know, or not know, about TN. The heat has finally broken here in Seattle, so I’m happy for that!